I couldn’t help with the laxative one liner. I had a lot of fun working on this dummy load project. It’s been in my hands for about two years. Frank, K9TIE, sent me the assembled can a few years ago, but I never went to the store to purchase the mineral oil (a laxative). I decided that I would build it since I needed a higher-power capable dummy load. I finally found the mineral oil at my local Wal-Mart, but they didn’t have enough so I went to the Dollar General. It’s cheaper at Wal-Mart by 50 cents. The next thing is that I needed almost a gallon since Frank and I used gallon sized cans for our project. While others built their using quart sized cans, I believe that there is an advantage to using the gallon sized can: increased use time and possible power handing. 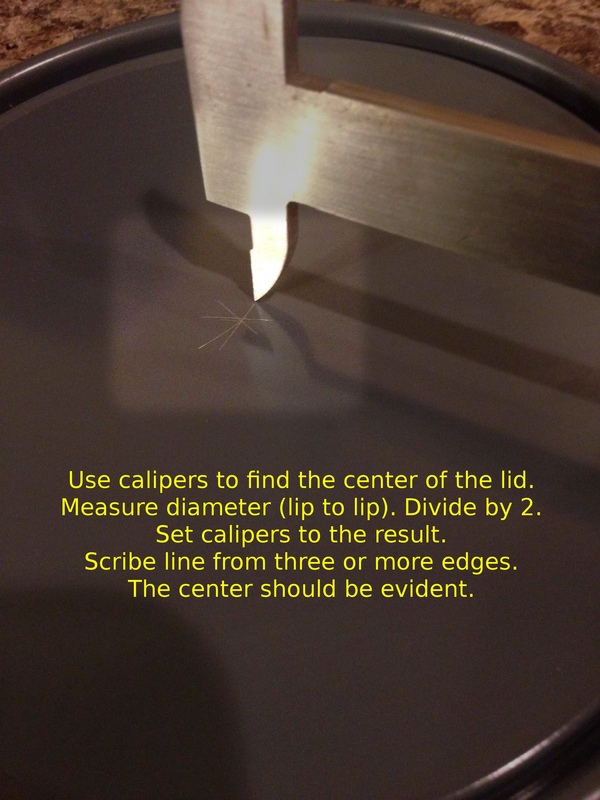 I used calipers to find the center of the lid. 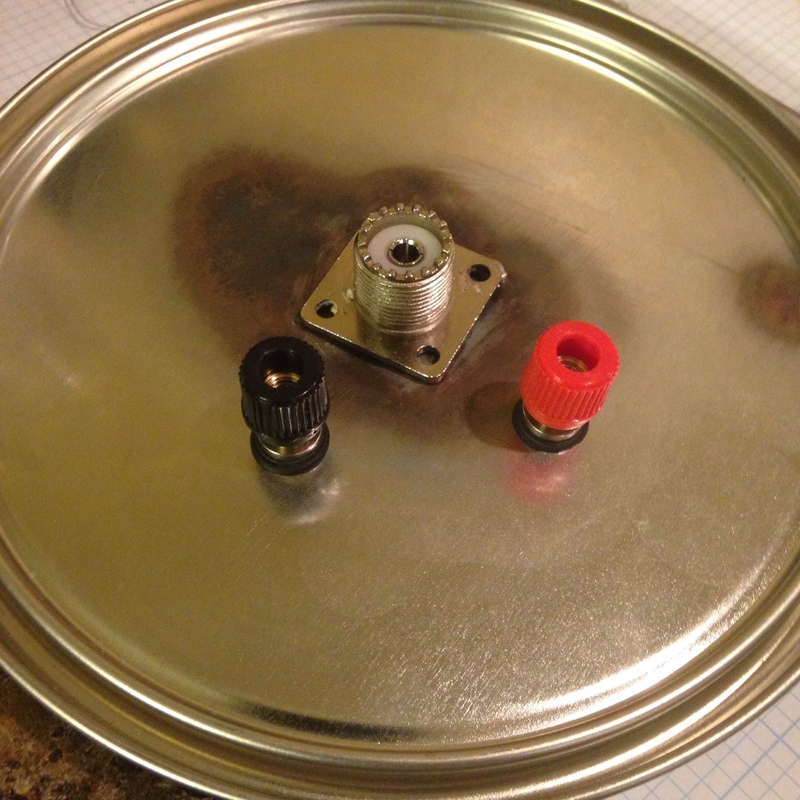 Then I made a smaller diameter circle to find where the two binding posts would be anchored. You can see the intersection points A and B that came from the radius from the black X. The holes were drilled, and then I used a stepper bit to make the final hole sizes. 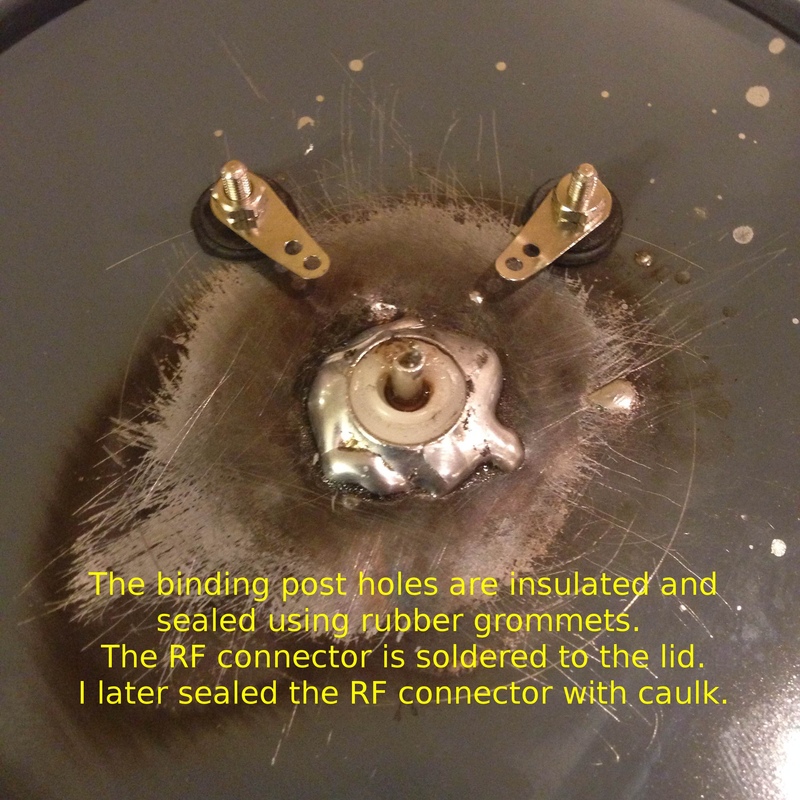 The binding posts were not soldered to the lid. 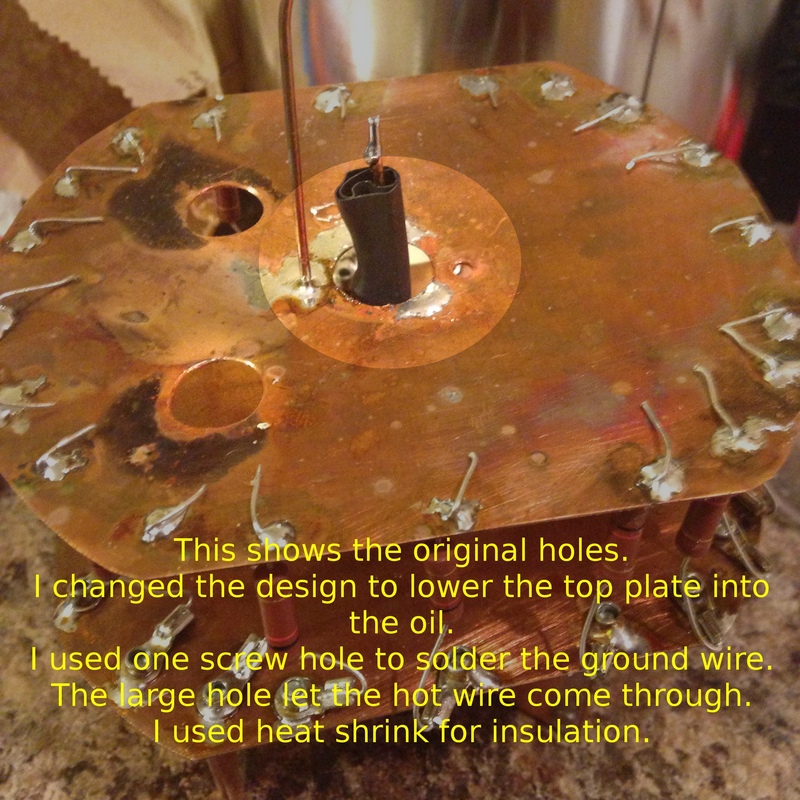 I used rubber grommets to insulate them and seal the holes. The top plate shows some of Frank’s original holes. I modified his design a little based on a suggestion from a fellow ham. I lowered the top plate a little so I could use less oil while still keeping the top plate submerged. The rest of the build followed the other instructions found on the web. 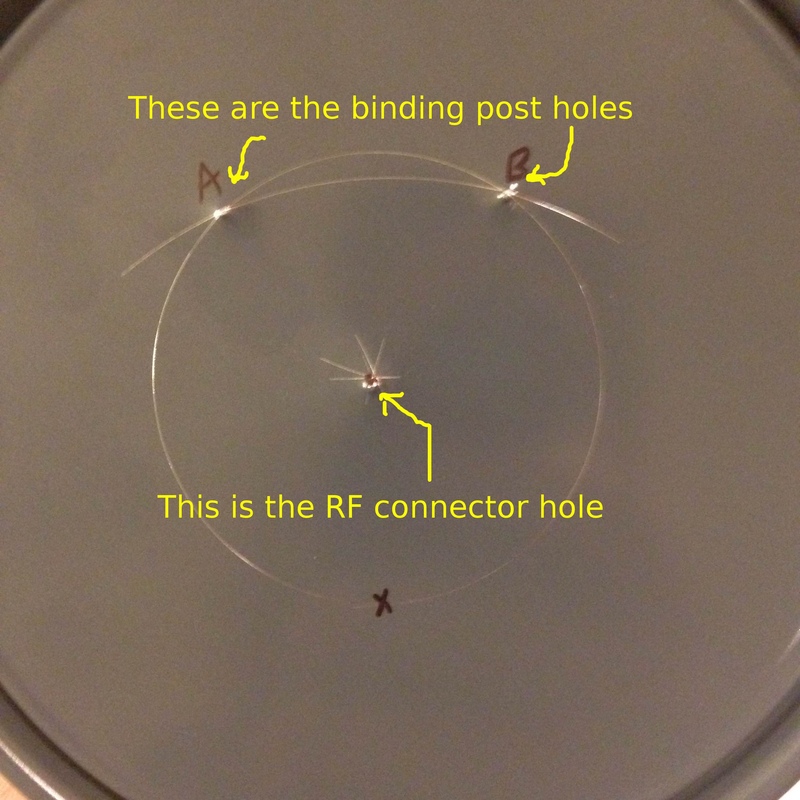 I’m not exactly sure of the origin or part number of the resistors in my can, but I assume that the data from any 3W metal film resistor should be similar to mine. Judging that the power rating diminishes at 70 degrees Celsius (about 170 degrees Fahrenheit), you probably don’t want to heat your oil to this temperature. This is what I used to judge the CW power rating for my gallon can. I chose 130 degrees Fahrenheit (54 degrees Celcius) as my limit. If you’re driving the dummy load with low power (less than 200 watts) then this math doesn’t matter too much. 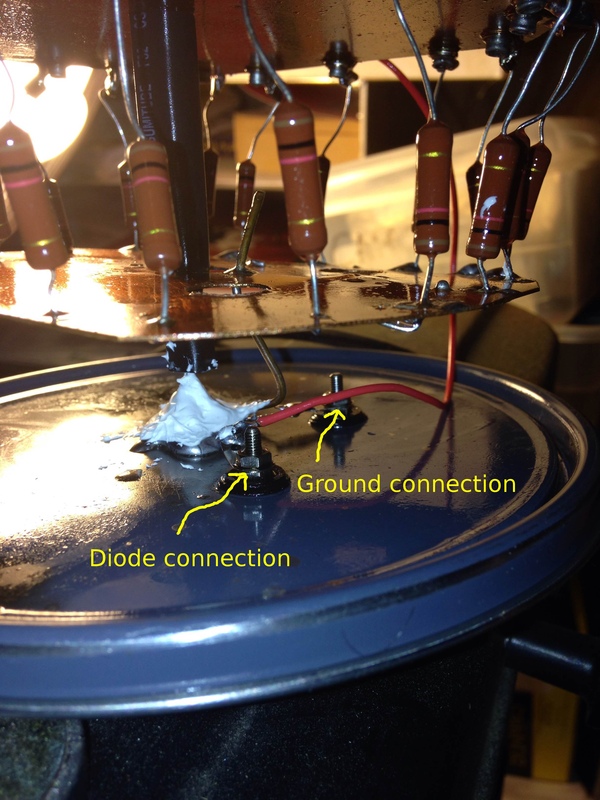 First, the 20 resistors at 3 watts comes out to 60 watts with no cooling. Based on my own experiments, you can drive resistors at about ten times their rating for short periods of time without cooling. (See my experiment at www.tech-tut.com from March 2010.) The result of that experiment was this: at 9x the power rating, 1 minute could sustained without damage, 2.5 minutes and 5 minutes showed signs of failure, but were still within tolerance. 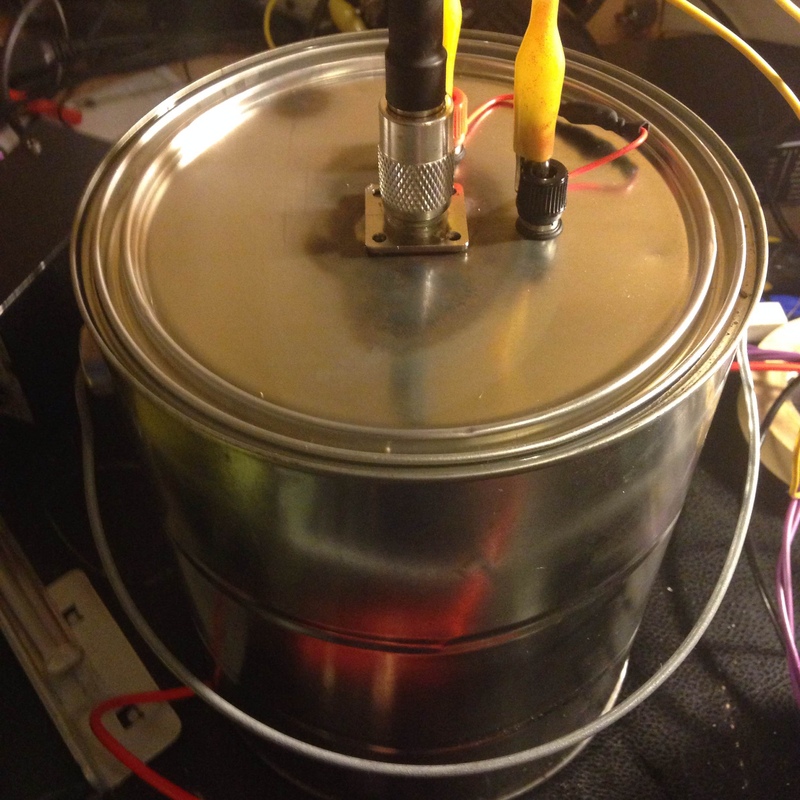 My experiments with oil cooling performed on May 16, 2014 were a little flawed because I messed up the measurements, but the results did show that exceeding the power rating of resistors is possible using oil cooling. Here’s a brief explanation of the results. 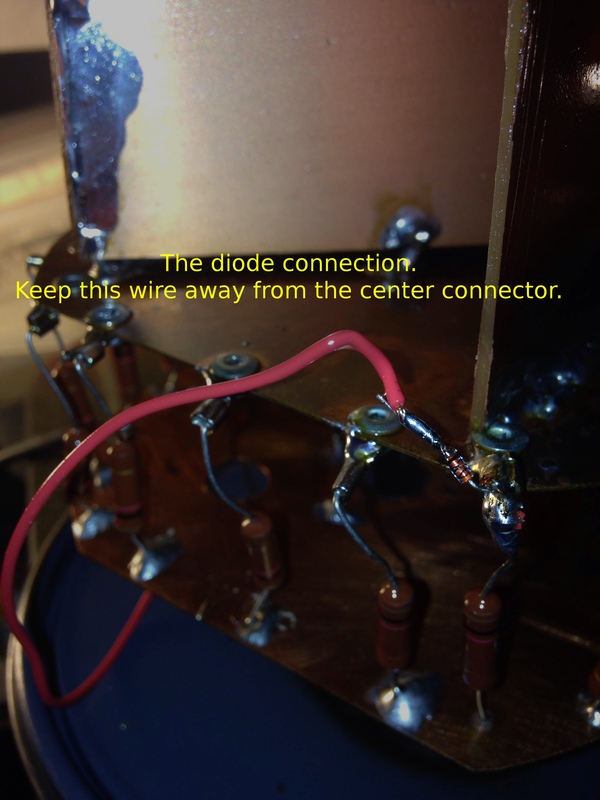 Voltage = 15Vdc, Resistance = 47 ohms 1/4w, Power = 5.13 watts (20x power rating). Outside oil I’ve seen these go up in smoke in just a couple of seconds. They survived all five of my tests in oil. 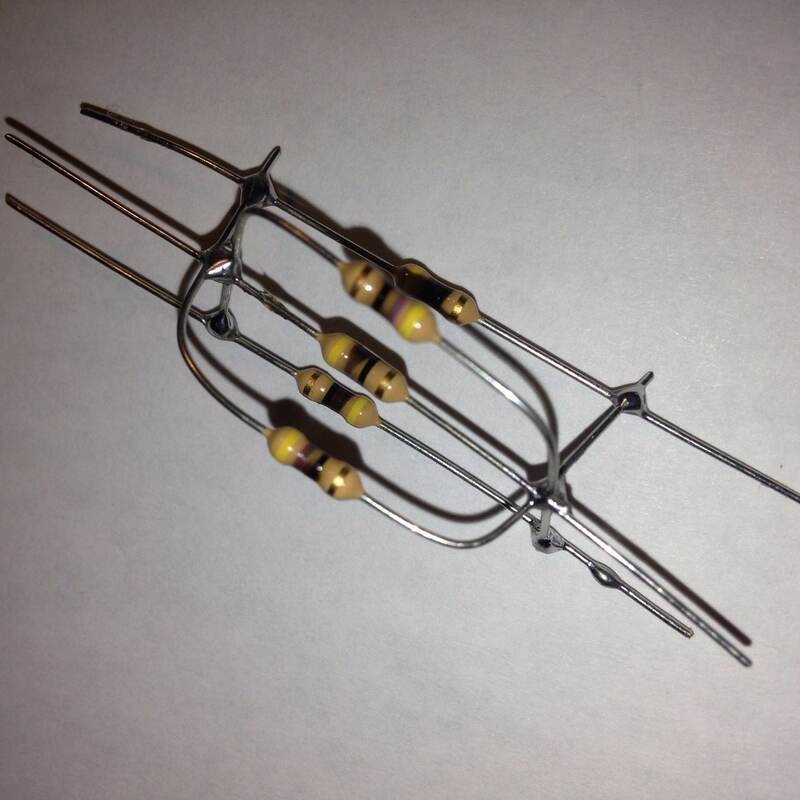 Just for fun I soldered five 47 ohm resistors in parallel for a resistance around 10 ohms. The first test was to run them at 10 volts for 15 minutes. At 8 times their rating they looked almost new. Then I ran 15 volts through them for 20 minutes. The surface temperature of the oil started at 83 degrees Fahrenheit (28 degrees Celsius) and finished at 170 degrees Fahrenheit (76 degrees Celsius). They were quite charred, but still within their tolerance. 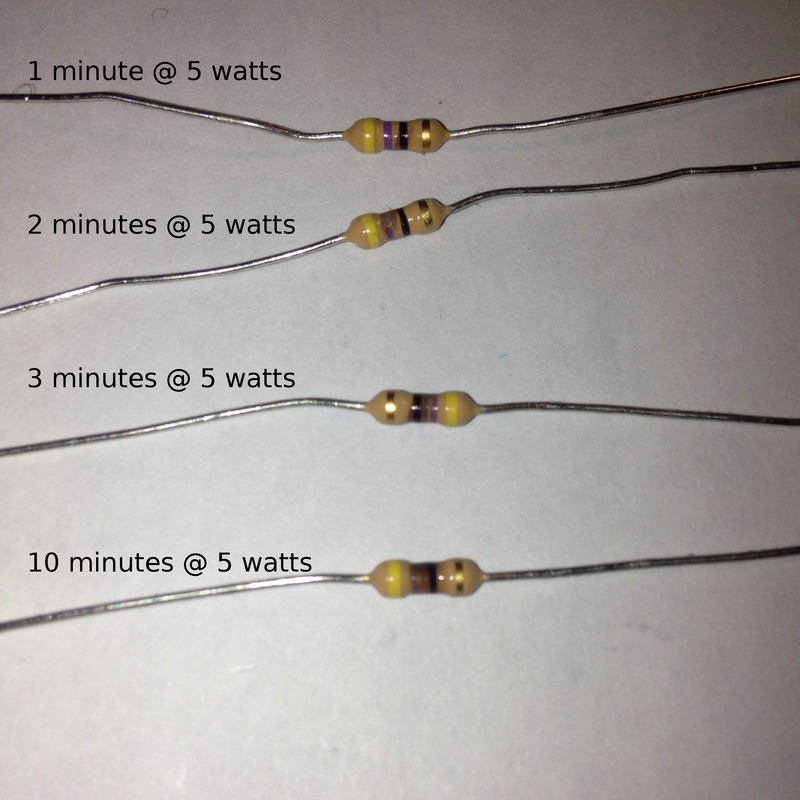 The fun part of this experiment was figuring out how fast the oil would be heated using these resistors. (Specific Heat of mineral oil is about 0.4, weight is in pounds, power is in watts, time is in hours, and the temperature is in Fahrenheit.) 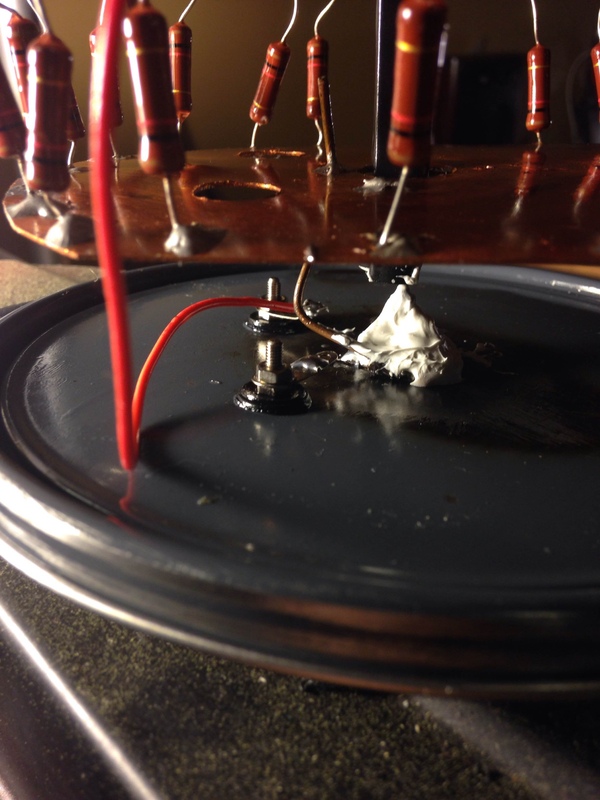 The experiment variable that I did not control was the amount of heat lost on the surface of the oil, but despite that my calculations were close. Using this formula I estimated that 10 watts would raise the temperature of 8 ounces of oil about 39 degrees Fahrenheit in 15 minutes. The actual measurements: start @ 90 F (32 C) and end @ 123 F (51 C). The second test was at 25.5 watts. The calculation came out with a result of an increase of 133 F in 20 minutes for 8 ounces of oil. My actual result: start @ 83 F (28 C) and end @ 170 F (77 C). The increase was only 87 F. I imagine that something happened that I didn’t see or was not able to measure. My open container may have cooled some of the oil since the air temperature was about 80 F.
I concluded that I would only run about half of those times (or less). If the ambient temp was 80 F, you’d be close to water’s boiling point, and well past the acceptable power derating of the resistors. I wouldn’t operate past an increase of 60 F above the ambient temps, especially if you’re operating at anything above 200 watts. The resistors will be getting close to a thermal runaway when it nears the 170 F point when operating past their power rating. If someone has the time, and they want to see if this would work, I’d be happy to hear about the experiment. I don’t have anything that exceeds 60 watts output, so I won’t be trying it anytime soon. I’ll be revisiting this experiment again myself just to try to confirm how much torture these home built dummy loads can handle. This was a fun read. Although I like to mess around with electronics I’ve never thought about ‘torturing’ components. That’s the best part of being grown up is you can destroy stuff and call it “testing a hypothesis.” Over powering resistors, reverse voltage on capacitors, and driving things beyond their capability is all done in the name of science.